A fire that burns a forest to the ground... A cloud of insects that eradicates from the landscape a particular tree species... A tornado that deracinates a grove... Each of those disturbances could be a star in the next disaster movie, but they are far from being so awful. Contrary to man-made recent disturbances, like climate change and acid rains, forests have had time to evolve to be resilient (Property of an ecosystem or another ecological unit to survive after a stress.) to Nature's wraths. Obviously, the trees that do fall pay a harsh price. But others, that were patiently biding their time, germinate, grow and proliferate. Some trees do die. But the forest, which has adapted a long time ago to those disturbances, regenerates and regains its balance. 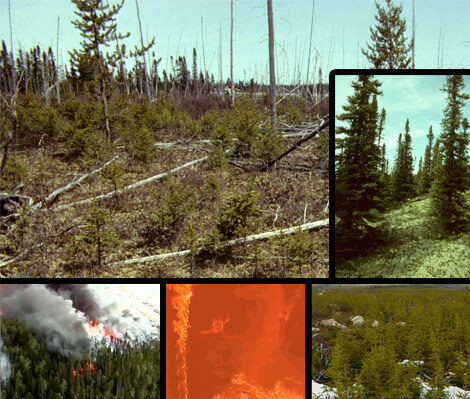 In the boreal forest, fire is the main disturbance trees have to contend with. Some, like firs, proliferate between fires. Others, like pines, impatiently await a good fire to get rid of the competition. Either way, boreal forest trees have in common the fact that if some individuals get burned to the ground, the species themselves live on.